When the trashed greenhouse is waiting for you to get your ACT together, the weather is foul and you just don’t fancy dragging yourself out and up the hill to the allotment I’ve found time spent in the kitchen satisfies – as does soup, aka potage au potiron. Thank you for all your messages of support, it means the world to me and I know having friends like you guys is precious. How can I thank you? A start would be inviting you all to share a bowl of soup with me. Imagine sitting down to lunch with you all – that would be one hell of a lunch party!! The recipe comes from Jane Grigson who in turn snaffled the idea from Orléanais region. That’s the way with recipes, they are once tasted, later tested and promptly passed on. A bit like the naming of pumpkins; we start out in Central America where pumpkins originate from but move to Europe for a modern day definition – the word pumpkin originating from the Greek “Pepon” which roughly translates as large melon (more of melon’s later). The French later adapted the word Pepon to Pompon, the British changed the French Pompon to Pumpion and the Americans changed it to Pumpkin. 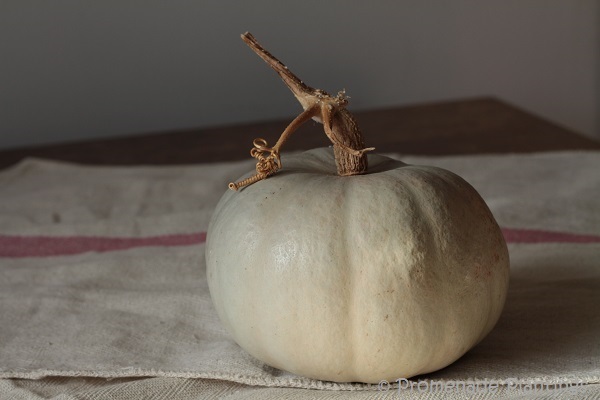 So where does the Potiron come from – the modern day catch all French for winter squash. There’s time travel in international language for you! Back to the Greek for large melon – have you ever cut into a pumpkin and smelt the flesh – it smells of melon, sweet and honey-like and yet when cooked not a trace of melon remains. The Greeks knew what they were on to. 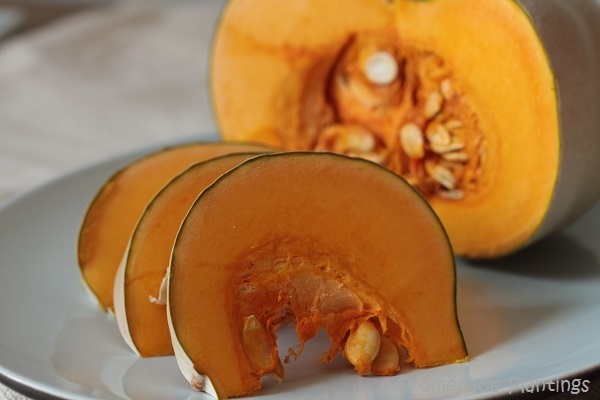 I’m using Crown Prince, an Australian Blue pumpkin, whose flesh is firm, dense and bright orange, the skin thin and the seeds large, it cooks well and holds shape, isn’t stringy, stores well and simply put is the best pumpkin variety that I grow. If I could only grow one variety of pumpkin it would be Crown Prince – reliable, a good size and tasty, remember the most important element is the taste! It needs room to grow as it sends out long vines, I’ve seen them reach 20 feet, they produce 2 or 3 good sized fruit per plant (so not overly prolific) usually weighing in at a respectable 1.5kg. Am I overselling it? Probably. This one was, admittedly a bit of a brute to cut into – it took a sharp heavy knife, a few attempts and a lot of pressure to cut into it. Peeled and de-seeded it morphed into Pumpkin Bread, Savoury Pumpkin Pie, Pumpkin Cake and of course the leftover parts went into soup. For a change I used a recipe and I’m glad I did. Leeks paired with Turnip cosied up nicely with pumpkin – smooth, satisfying with a hint of leek and not an over powering sense of pumpkin. For me the surprise was the lack of seasonings, I’d normally load a soup up with lots of herbs, garlic and anything that take my fancy on the day. I resisted the urge to veer from the recipe and in doing so learnt that not everything needs garlic or white wine adding to it to “enhance” the flavour. I decorated the soup for the photo with a few snips of fresh chives from the garden. The chives are the first herbs to make a re-appearance, a welcome sight after the rains of winter. The fresh green shoots lighting up the bare earth and delighting my tastebuds once brought indoors into the kitchen. Claire, I would absolutely love to sit with you and share pumpkin soup and lots of conversation. That soup is a beautiful color (as is the pumpkin). I never would have thought of turnips with pumpkin. I think the “pepperyness” of the turnip helps balance the sweetness of the pumpkin, well that’s my theory! I was so sorry to read about your green house….and glad you have turned dismay into an amazing sounding soup! Our chives are up, and oh that happy green glow is a welcome sight. I haven’t seen these blue pumpkins before – thank you and wow! I’m pretty sure this is the type of pumpkin we used in our cooking class in Lyon a couple of years ago; if I recall correctly it has an enormously hard skin and is brutal to cut through. We put scallops browned in butter into the soup for garnish. It was glorious! I didn’t think of growing pumpkin but I might! another true culinary delight! Beautiful results, and pics! I also learned a new word…”snaffled”. Like that one a lot and will be using it as soon as the situation warrants! We can share 🙂 I just made fridge soup – leeks, carrots, pumpkin, cauliflower, turnip, swede……. you get the picture! The soup looks delicious even if turnips and pumpkins are not my first choice for ingredients. The Crown Prince pumpkin sounds pretty special. I love growing this type of pumpkin, it’s definitely a favourite to grow. Hope you have a super week ! 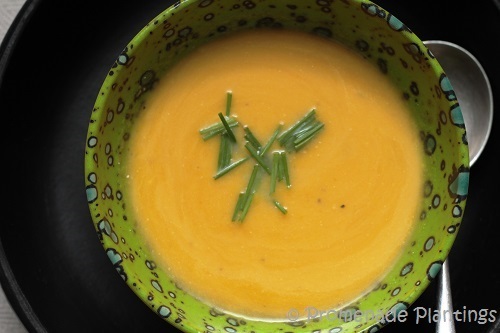 Claire, your photos … and your posts – is just so beautiful … Love pumpkin soup. What a fantastic recipe you have served us here. Easy and not too many ingredients. I still see pumpkin in the shops in the UK and France – often I see the Butternut squashes, which last well in the kitchen and taste good too. Claire, I love butternut … and that I can get in my supermaket – great idea … not so big neither. Yes, sometimes I see really small ones – perfect for one or two meals at the most. Have a great day Vivi! Deeelish! And doesn’t the pumpkin look so much like one of those sweet melons (charentais? honeydew?) Pepino in Spanish is a little cucumber – similar word to Pepon and I guess from the same family! Since coming back ‘west’ I’m revelling in the subtle flavours of unadulterated cooking – this looks very interesting, with the turnip doing the alchemy with the sweetness of the pumpkin. Looking forward to winter to give it a go. What a beautiful informative story to go along with a soulwarming soup which we Australians tend to think of as almost one of our national dishes. The ‘blue’ is a beautiful pumpkin but my weak wrists have a fight with cubing it each and every time . . .have to try your recipe as use leek but have not included turnip . . . actually parsnip gives the concoction a lovely flavour also . . .
Of course you Aussie would be right to consider/think of it as a national dish! Well, I do not have enough garden space to grow my own – so they come from the supermarket, boo-hoo!! However, I oft get around this by buying the already cubed version: not as fresh, but . . .
Ho there, wouldn’t a blogging party be a blast?! I don’t think a lunch time would cover all the chatting that would happen ?! potage au potiron sounds so much more elegant than pumpkin soup, doesn’t it? And, ah, creme fraiche! What could be more delightful in any vegetable potage. Mmm this soup just looks so breadly dippable! Looks so delish!! I love pumpkin anything! What a luncheon that would be, and oh the dishes we would feast on! I find pumpkin so versatile in the kitchen and I especially love the ones that store so well so you don’t have a monster sized glut on your hands! What a beautiful soup! Perfect for foul weather. I think the word foul was made for dreadful weather. Time spring arrived I say! I’ll forgive you the turnip, as it’s a great soup. Just what I need on another wet afternoon. Claire this is just a lovely late winter soup. The color makes me happy as I sit looking out my window at the snow falling. I like the combination of turnip and pumpkin, it must have a nice flavor. Hi Karen, I think the “pepperyness” of the turnip balances the sweetness of the pumpkin. John, you are so kind, thank you x I’m sure one day very soon, I’ll be putting my boots on and getting on up there to have a good old Spring Clean. Now back to this soup and the imminent trip to the pub, do you think we could get away with only three beers….. I didn’t know it had that name. I know it as Kabocha or Japanese pumpkin. Way better than the typical American we carve for Halloween. Naturally sweet. Soup looks just yum. I’ll have to cut ours open soon. Hi there, I know what you mean about the carving pumpkins – they really are tasteless. Good to hear you can get interesting pumpkins though, I’ve grown Kabocha types in previous years and found them tasty, I believe they are a different variety – but as I said tasty too! 🙂 I see what you mean – very similar colour. But at the end of the day they are both tasty 🙂 Hope you have a super day!